Over the last few years we’ve seen a number of online music stores that offer independent artists a way to sell their music without a recording contract. And while a handful of these sites, like AmieStreet, have done especially well, but they tend to be pretty involved – you can’t just upload your songs and start getting paid. Apricado, a new startup that launches today in private beta, is looking to solve this problem by streamlining the process as much as possible. The first 50 musicians to email support@apricado.com with “TechCrunch” in the subject line will be able to set up shop in the private beta. Apricado makes the music submission process ridiculous easy (perhaps to a fault): After uploading a song, the site will automatically detect the artist name and generate a music store (for example, a song by Mika would generate www.apricado.com/Mika). Each song sold will be distributed without DRM, and the site will only take a 20% cut of the revenues (industry standards are usually 30% or more). Visitors who navigate to this site will be presented with a list of available songs. 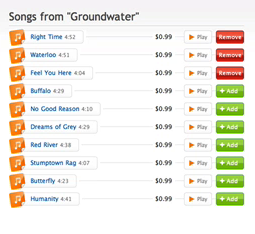 After entering their credit card information on the same page, the selected songs as downloaded as a single .zip file. Artists can also get embed codes for their stores, so they can offer a mini-marketplace on their blogs or MySpace (a Facebook app is on the way). Unfortunately, Apricado’s simplicity may also be its undoing. The site currently has no automated way to monitor user submissions to determine if recordings are copyrighted or previously uploaded, which means you’d be free to rip your favorite CD to your hard drive and upload it as if it were your own. Apricado CEO Jeff Ward acknowledges that this could be an issue, but says that it will implement a blacklist to filter out songs by well known recording artists. For those artists that aren’t on the blacklist, the site will likely rely on the “YouTube method”, using DMCA takedown notices to help them track down pirated music. This may work well enough (or not) for YouTube, but there’s a major difference: Apricado will actually be selling the goods, which will likely make the legal repercussions involved even more severe. Apricado has a good idea – such simple audio storefronts could conceivably make it the YouTube of music stores, appealing to both professional musicians and novices alike. But unless it can find a way to effectively monitor what gets uploaded, it won’t stand a chance.